Nearly all areas of work are nowadays organized in teams. The TeamSpace transfers this concept onto your reporting platform. The TeamSpace concept evolved from the experience that shared resources, such as shared directories (aka., network drives) come at the price of an immense maintenance effort. The challenge is that while everyone has to be able to access the data he or she needs different teams usually have a different perception of the data and thus need a different view or structure on possibly the same objects. This is exactly what TeamSpaces provide. All report objects in ReportServer are organized in a single tree based structure only accessible by administrators. TeamSpaces allow to create a custom view upon a subset of these objects without interfering with the structure provided by the administrators. Furthermore different TeamSpaces provide different structures upon intersecting subsets of the available report objects without interfering with one another. To support collaboration within teams, all members of a TeamSpace can edit the available objects. The clue: All changes by one member are directly available to everyone else on the team. To, for example, share objects with a user whom you do not want to allow to edit your objects TeamSpaces provide a simple role based permission scheme. Guests Can access objects in the TeamSpace read-only. A guest cannot make any changes in the TeamSpace. Users Can edit any of the objects in the TeamSpace and create new variants but may not import objects. Users cannot edit the configuration (for example, manage members). 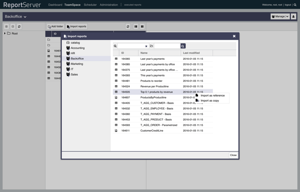 Managers Managers have all permissions of a simple user but may also import objects and manage TeamSpace members. Administrator Have the additional right to configure name and description of the TeamSpace. They may also delete a TeamSpace if in addition to the Administration role the user has the generic delete permission for TeamSpaces (see Administration Guide). Note that the roles in the TeamSpace do not regulate which data can be accessed by a certain user. Access permissions are centrally managed by the system's administrators. A member of a TeamSpace might be able to see a report object but may not be allowed to open it. Every user can be a member in multiple TeamSpaces. You select the current TeamSpace via the dropdown menu on the the right of the TeamSpace bar. The menu contains options for the currently select object. The green double arrow refreshes the content area. The single green arrow opens the parent folder. The folder provides quick access to all parent folders. Allows the generation of a new folder within the currently opened folder. 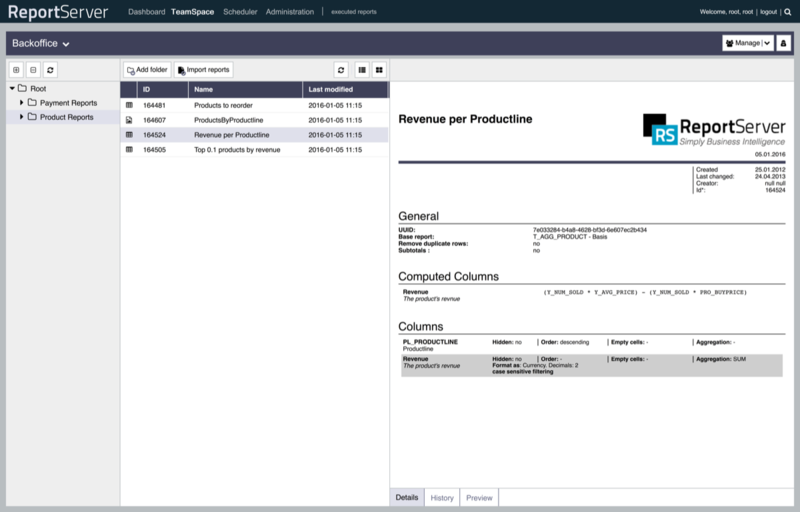 Opens the import view which allows to import base reports into the TeamSpace. The right panel provides details to the currently selected object. Use the tabs to switch between various information. Via drag and drop you can move objects from one folder to another. For this you can either drop objects on a folder in the content area or in the explorer. You open a context menu for any object via a right click. Amongst object specific commands, the context menu provides commands to rename or delete the current object. The following symbols represent the various object types that you might encounter in a TeamSpace. The symbols representing reports can additionally be masked with a small chain, meaning that the report is only a reference. Further information on report references can be found in Section Importing Reports. A folder. Used to structure TeamSpaces. 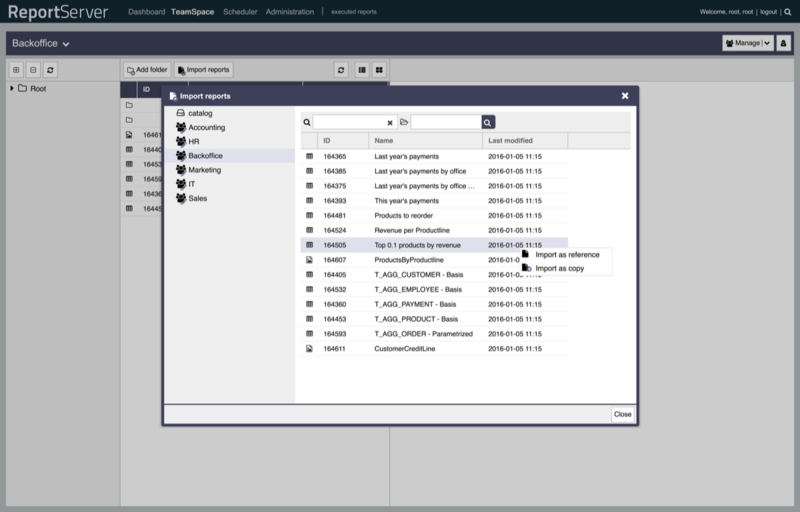 Exported reports can be stored within a TeamSpace. In this case the symbol corresponds to the format the report was exported in. 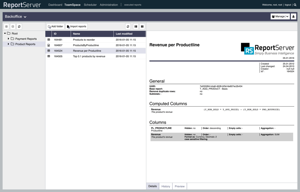 Further information on exporting reports into the TeamSpace can be found in Chapter 9. A graphical report (i.e. not a dynamic list). Via the button configuration you can access the property panel for your TeamSpace. Here you can set a name and a description for the TeamSpace as well as edit who can access it and in what role. If you have the administration rights for this TeamSpace you will also find the option to delete the current TeamSpace or add a new one. To configure which TeamSpace is loaded initially open your user profile. For this click on your name on the top right corner. There you can navigate to the TeamSpace options and there select your default TeamSpace. 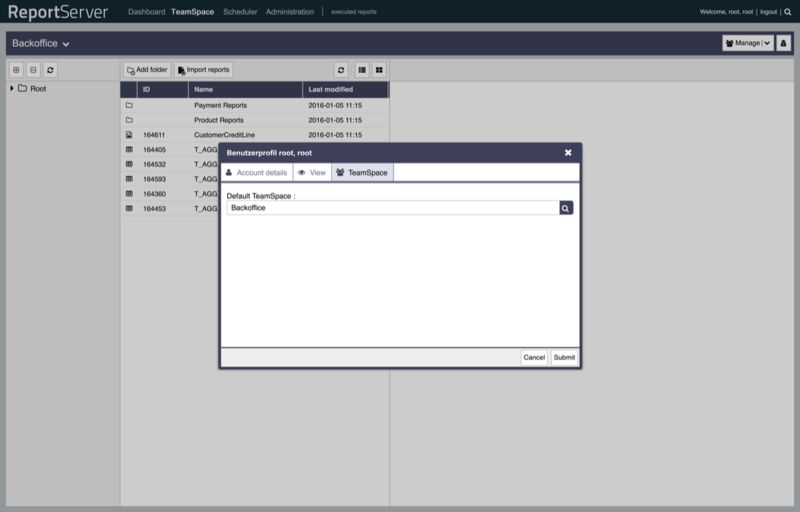 If you hold the role of manager or administrator you can import into your TeamSpace any report or variant that you have access to. Any report/variant object in a TeamSpace can be seen by any member of the TeamSpace, regardless of the role the user has. This, however, does not necessarily mean that the report can be executed by that user. This depends upon the user's specific permissions. The dialog import reports displays all report objects that you can access. This includes all of the objects in different TeamSpaces you can access as well as possibly objects from a global catalog. In this mode the source object is duplicated and thus an independent object is created in the target TeamSpace. Changes on the source object do not influence this copy. An object imported as reference will not be duplicated but only a reference to the source will be generated. Thus any changes to the source object are directly visible at the reference. You cannot change the reference directly. However, you can of course create new variants based on the reference and stored under a new name which then live as independent objects from reference and source. If the reference is deleted this does not affect the source object (which are assured that the reference will still remain valid and accessible. Imports from the global catalog are always as reference. Users can be given the TeamSpace Administration permission (see Administration Guide for further information on permissions). If a user has this permission he or she can access any TeamSpace with full permissions. The TeamSpace selection for administrators can be opened via the right most button in the TeamSpace toolbar.